The main lobby of the Yanggakdo International Hotel. The decor was extravagant in a soviet-70's way. Large golden chandeliers hung down from the sloped ceilings, and giant murals of majestic forests rose above the elevator bay entrance. Although the hotel was filled, it was only filled with tourists - no locals, or other non-tour people. Normally for such a large hotel I'd expect to see other groups, local families and groups on vacation, and handfuls of business travelers. However here, the entire place was staffed purely for us (and the other marathon trip groups). I wouldn't be surprised if as soon as the foreign tour groups left, the entire place shut down completely - the vibe with the space, furniture, signage and staff felt very temporary, like it could be turned on and off at a moment's notice. 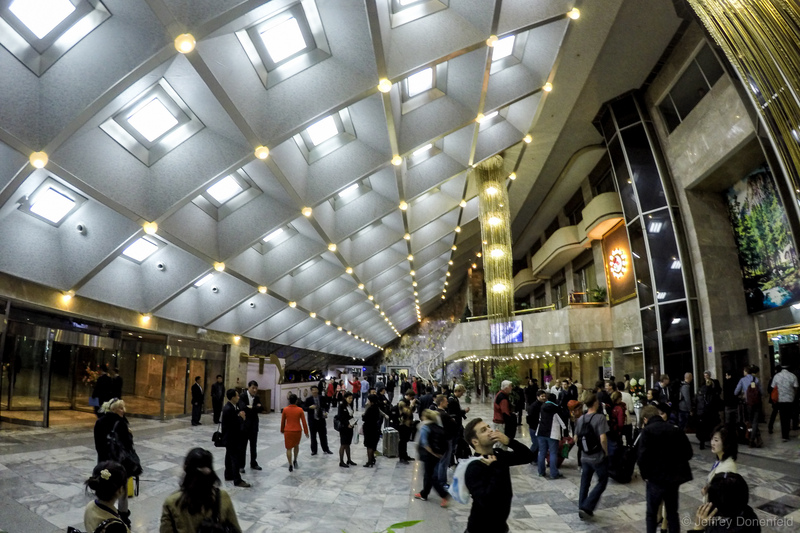 The main lobby of the Yanggakdo International Hotel. The decor was extravagant in a soviet-70’s way. Large golden chandeliers hung down from the sloped ceilings, and giant murals of majestic forests rose above the elevator bay entrance. Although the hotel was filled, it was only filled with tourists – no locals, or other non-tour people. Normally for such a large hotel I’d expect to see other groups, local families and groups on vacation, and handfuls of business travelers. However here, the entire place was staffed purely for us (and the other marathon trip groups). I wouldn’t be surprised if as soon as the foreign tour groups left, the entire place shut down completely – the vibe with the space, furniture, signage and staff felt very temporary, like it could be turned on and off at a moment’s notice.